The golden animations of this card is so cool. Too bad the card is so poor few will ever get to see it. Nonsense! This card is OP as hell! Can't believe nobody said it yet, but if you are still having trouble with heroic Heigan (Better late then never! ), this card is a godsend. Place it where his power will hit and he will regen each turn and Heigan doesn't go after it generally since it's not much of a threat damage-wise. I really tried to make this guy good. But he's just not. How many minions carry damage over for a whole turn? And if it pulls a removal after you boost it, you've lost 2+ cards to one. Seems like it's a good card in priest, and maybe ok in Druid... not sure about the other classes. 1 attack is pretty bad, best thing Priests hope for is to taunt him up and buff him with PW: Shield, but then you're just trying too hard to make him work, he isn't good at all, period. Screams to be boosted. Don't play him next to an auchenai though. She's this thing's kryptonite. 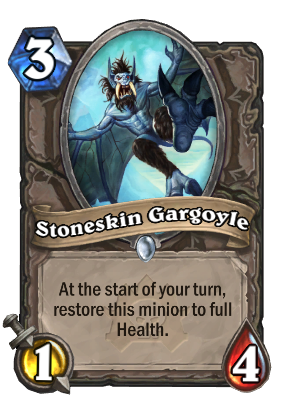 About the card itself: he seems like a good creature in hero decks that can easily deal one damage with their hero power, cleaning up 3/2's like it's nobody's business. Again a good contestor for winning the attrition game. Def alot of potential with any buffs! What a great Card! been trying it with Zoo, but i guess it works with a lot of decks. Does its ability count as a heal? By the wording, I'm guessing not. I feel this will be one of those cards that end up being ok/good in arena but not doing much in constructed. And a free win if your opponent has any removal or silence. If you can taunt (Also give it extra health) this thing its ridiculous just keep anything that can one shot it off the board and suddenly it regens all its health after taking a battering.